No one wants to hear the vet utter the words "congestive heart failure," but getting a diagnosis can work to your dog's advantage. Once you know your beloved companion is suffering from CHF, you and your vet can take steps to prolong her life and help her feel better. With treatment, some dogs live for a year or more after a CHF diagnosis. 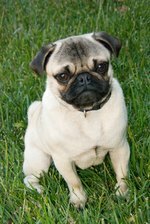 You can further help by understanding the canine congestive heart failure stages. Understanding how her illness will progress allows you to prepare yourself to support your dog through every stage of her journey. As the heart muscle weakens and starts to pump less effectively, fluid will start to accumulate in your dog's body. This fluid will generally collect in his stomach during the early stages of CHF, causing it to swell. Over time, fluid may also start to collect and cause swelling in his legs too. Eventually, fluid will settle into your dog's lungs, making it difficult for him to breathe. You may notice that he pants or struggles for air, even when resting. He'll also develop a loud but unproductive cough as his body tries to push the fluid out of the lungs. At this stage of CHF, you vet will likely reduce the salt in your dog's diet and prescribe a diuretic to help your pooch push out excess water. Your vet may also recommend periodic oxygen treatment or an abdominocentesis. During this procedure, your vet will use a needle to extract some of the fluid in your dog's belly to make him more comfortable. As fluid accumulates in a dog's abdomen, it can push on her stomach and make her feel full. Some of the drugs used to treat CHF, like digoxin, can also cause appetite loss. To keep her health and strength at their best, your vet may recommend an appetite stimulant. You may also succeed at coaxing your dog to eat if you mix some of her favorite treats in with her kibble. Be careful with this approach, though. Some of your dog's favorite snacks might irritate her stomach and make her even more stubborn about eating. Talk to your vet before taking this approach to be sure you make good treat choices. Even if you can keep your dog eating, she may eventually stop. Unfortunately, a complete refusal to eat as life ends is common and can be a sign a dog is dying from congestive heart failure. The lack of adequate blood flow caused by CHF makes exercising difficult. As his CHF progresses, you may notice your dog is unable to take long walks or play fetch with the same unending exuberance he once did. Eventually, your dog may lose interest in these activities altogether as they become increasingly difficult for him. As he reaches the end stages of CHF, your dog will go from having little interest in exercise to none at all and may refuse to move any more than is absolutely necessary. You'll notice him sleeping more too. Even though you've done a good job helping your dog navigate her CHF, the very late stages will eventually come. At this point, your dog will frequently cough and breathe heavily even when resting. Her gums may turn a bluish-gray color, and she may faint upon standing or walking. You're likely to notice that she has trouble doing anything at all, including sleeping. This is particularly true of dogs who sleep on their sides. You may also notice your dog seems unable to lay down, instead sitting upright to make breathing easier. At this stage, easing and managing the symptoms of CHF simply aren't possible. You can still help your faithful pooch, however, by kindly choosing to end her suffering. Though hard to do, providing an easy passing is sometimes the best gift you can give.